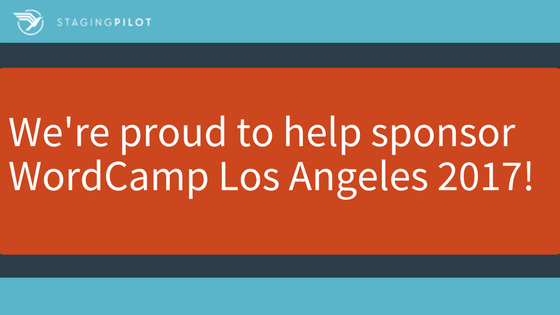 We’re Proud to Help Sponsor WordCamp LA 2017! And just like that, it’s time for WordCamp Los Angeles this weekend! StagingPilot is proud to once again be a sponsor of this fantastic community event. We’re based in Southern California so WordCamp LA is our ‘home’ camp and we’re looking forward to seeing so many familiar faces from the community, as well as welcoming new attendees! Our Founder and Lead Developer, Nathan, was one of the organizers for WordCamp Los Angeles in 2014 and 2015 and it’s a treat to see how the event evolves each year with the new organizing teams! Nathan and Phil (our Robot Wrangler) will be available to answer any questions you may have about the platform, and of course be happy to demo how StagingPilot automates WordPress updates and testing for you. We will have our signature StagingPilot planes on hand to give out as well, so stop by our table and say hello!